Just an update on what I have been up to since my last post. For starters I have been putting in some time helping out with the open source project http://www.bugnetproject.com/. For the most part I have been doing slot of refactoring and general cleanup of the code base. I have also have been doing some UI standardization to make the UI more consistent across the different sections of the site. BugNET is an open source issue tracking project built using C# and the ASP.NET platform. The main goals are to keep the codebase simple, well documented, easy to deploy and scalable. It has been interesting helping out on an open source project along with the other developers and I have enjoyed working on it so far. I got started working on it because the company I work for http://core49.com needed a bug tracking system that would us to track bugs/issues as well we wanted clients to be able to enter issues as well. The first thing I did for the project was update the email template engine to use Xml/Xslt to allow for an easier way to generate some of the issue emails that get sent out. I look forward to doing more work on the project in the New Year as there are some cool ideas on the drawing board for making it even better. This post is in response to the common request on the ASP.NET forums for adding summary totals in a GridView control. The idea is to use the FooterTemplate of each column in the GridView that has some kind of value to place the summary of the column. 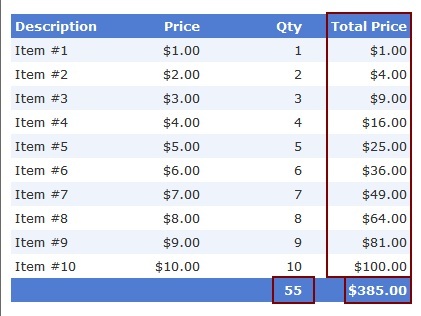 The sample also goes on to show how to use the RowDataBound event to set the actual totals as well to add a Total Price column that takes a quantity field and a price field to display the total for each line. What we want on the grid is simple enough, display a line by line total as well a summary of the Qty and Total Price fields. Below are the columns that make up the grid view. For the columns that come out of the database we would simply use BoundField columns. For our calculated columns we want to use a TemplateField so we can add asp.net controls to the columns so we can inject our own data. I tend to use the Literal control as it renders just the contents of the Text property vs the Label control that renders a SPAN html tag. For the columns that will contain a summary total we use the FooterTemplate to place Literal controls so we can write the summary data out. To inject our computed data we use the RowDataBound event on the grid. This event is fired for every row when the data is bound to the row and allows us access to the controls and the data at the same time. We first check if the current row type is a DataRow (items in the grid) and then we grab an instance of the actual data that makes up the row. This will be different if you are using a generic list of your objects, you would cast the DataItem as that object. Then we get a reference to the data from the DataRow and perform our calculations, then we get an instance of the Literal controls in the row, check if they are null or not (null would mean we did not find them) and set the Text value. If the RowType is Footer we need to get the summary data from the entire table of data. To do this we use some Linq in the GetTableTotals() method to get a sum of the quantity and calculate the sum of the quantity * price for each data row.